Cartography (mapmaking) has been an important part of our human history for a long long time. Maps help us define, explain and navigate the world. 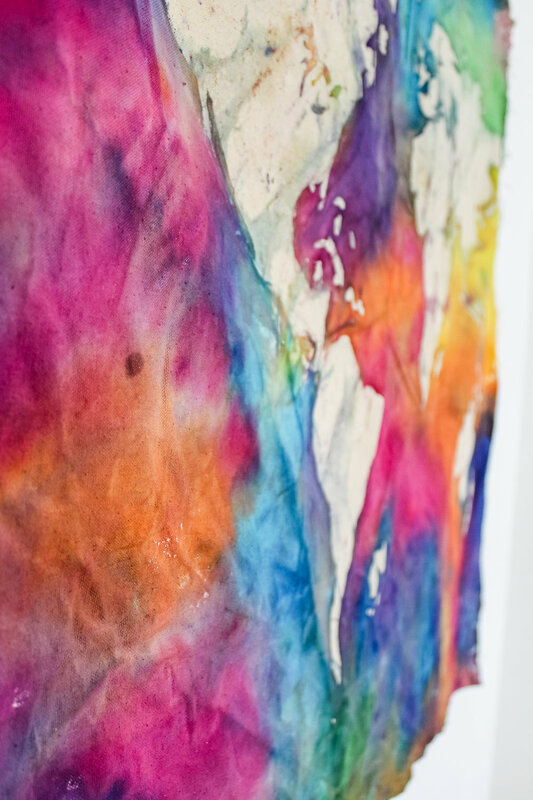 Join us in the studio for a soothing, satisfying and stylish art workshop. Batik, an ancient art form refers to a melted wax resist which, when applied repels colouring. In this workshop, we will use local beeswax from The Honey House in Clarksburg (which will make the studio smell oh so sweet) to paint our Batik. 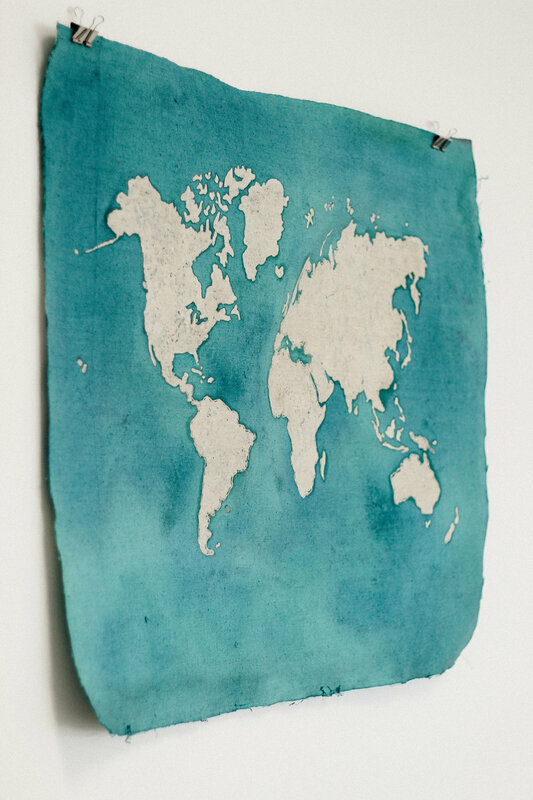 Part design, part painting, party fabric dying, you will create a stunning world map hanging. This unique workshop will help you discover a whole new set of skills! Unlike my other Batik Workshops, your canvas's will be pre-drawn with the world map especially for you by me. This project is notably more advanced than our introductory Batik Workshop, but don't let that discourage you. 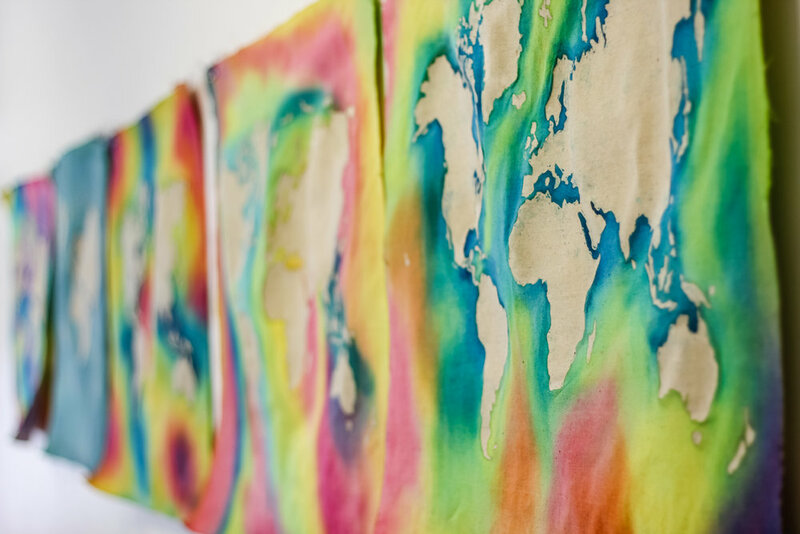 Your World Map Batiks will be prepped and ready to go so all you need to do is paint and dye. This is one of the most unique workshops out there and the rewards are oh so sweet! To feel inspiration or to see one of these stunning World Map's for yourself, head to The Georgian Artisan Shop in Thornbury, where a few of my pieces are on display for sale. All skill levels are welcome. Spaces are very limited. PRE-REGISTRATION REQUIRED. Note finish times may vary as some work faster than others. TO REGISTER, CHOOSE YOUR DYE BATH COLOUR BELOW FIRST.